In the rapidly growing cannabis edibles market, cannabutter remains a consistent and highly regarded ingredient. Decades ago, using cannabutter was the manner in which home bakers infused their cookies and brownies with activated tetrahydrocannabinol (THC). In today’s age of infused cooking oils and cannabis recipe books, cannabutter remains as popular as ever. Once created, cannabutter can be used in a variety of ways for both cooking and baking. Let’s learn how to make this time-tested cooking ingredient, as well as discover some great ways to use it. Making cannabutter includes heating butter and cannabis together to activate the THC in the cannabis and infuse the butter. Activating the THC with heat is a process known as decarboxylation. Grind 1 ounce of high-quality cannabis flower and layer a cookie sheet with the crushed flower. Preheat your oven to 245 degrees Fahrenheit, and place the cookie sheet with cannabis into the oven for a half hour, turning the sheet once or twice while it heats to distribute the heat evenly. When you remove the crushed cannabis after a half hour, it will be very dry. In a large saucepan, bring 5 cups of water to a boil. With the water boiling, place a pound (four sticks) of butter in the water until it melts completely. Place the cannabis in the water and butter mixture, mix the solution, and set it on low so it slightly simmers. The cannabis should remain slightly above the bottom of the pan, not on the bottom. Cook for 2½ to 3 hours. The top of the mix should appear glossy and have a thick consistency. Remove the pan from the heat. Use a large, heatproof bowl, and place a double layer of cheesecloth over the top, securing it with tape or twine. Slowly strain the marijuana mixture through the cheesecloth and into the bowl, When the pan is empty, remove the twine or tape and lift the cheesecloth supporting all four corners. Squeeze out any butter that remains. Allow the butter mixture to cool. Place the butter mixture in a refrigerator until thoroughly cooled. The infused butter will rise to a solid top layer. Run a sharp knife around the perimeter of the butter and lift it from the bowl. Remove any remaining water from it. Your cannabutter is complete! Place it in the refrigerator for later use. 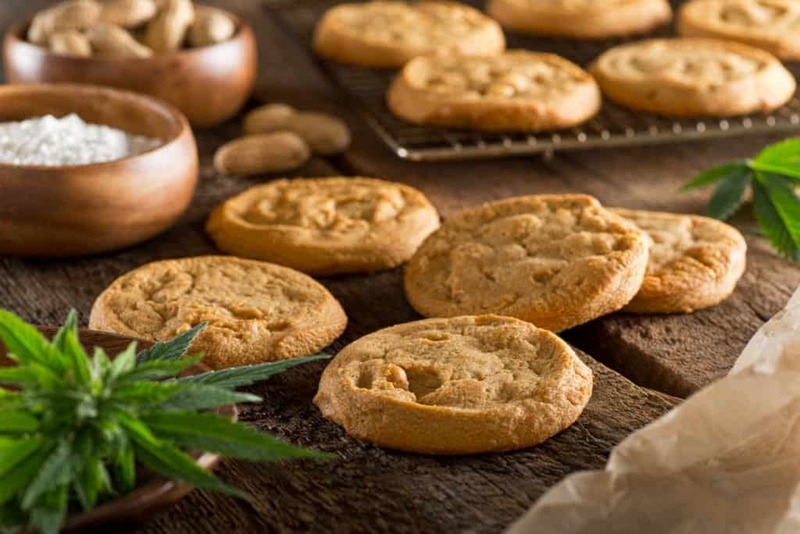 Although cannabis edibles often feature sweet dessert items, an increasing number of great recipes are being created to produce tasty savory dishes as well. Cut the squash into cubes, toss in a bowl with the olive oil, salt and pepper to coat. Place squash on a cookie sheet lined with parchment paper and roast in a preheated 350-degree (F) oven for a half hour or until the squash is golden and caramelized. Place squash cubes in a bowl and set aside. Melt the cannabutter in a soup pot over low heat, then add the onion, salt, and pepper, and heat on low-to-medium heat for 10 minutes, stirring frequently so the butter doesn’t burn. Add the roasted squash cubes and cinnamon. Stir for a couple of minutes. Add the chicken stock, bring to a low boil over medium heat, then reduce to a simmer for 2 minutes. Puree the soup with an immersion blender (you can also cool the soup slightly and puree in a blender in batches). Taste, and adjust the seasonings to personal preference. Drizzle a small amount of heavy cream on top and serve. In a cast iron skillet over medium heat, melt the unsalted butter and swirl melted butter in the pan to coat the edges. Add garlic and cook on low until lightly golden. Remove from heat. Pour garlic and melted butter into an electric mixing bowl (mixer should be fitted with a paddle attachment). Add cream cheese and mix on low until smooth. Slowly add heavy cream, mixing until combined. Add blue cheese crumbles, bacon, 2 tablespoons chopped chives, and 2 tablespoons chopped pecans to the mixture. Spread mixture on the bottom of a buttered cast-iron pan. Place the dip in a preheated oven, and bake for 20 minutes until bubbly. Allow to cool slightly. Top with remaining chives and pecans. Serve the warm dip with cannabuttered baguette slices (see below). Cut baguette into rounds and place on a parchment paper-lined baking sheet. Toast at 350 degrees Fahrenheit until golden brown, about 10 minutes or less. Liberally spread each baguette round with cannabutter and return to the oven very briefly until melted. Remove baguette rounds from the oven and enjoy with blue cheese dip. Boil a large pot of lightly salted water. Add elbow macaroni, stirring occasionally until cooked al dente (about 8 minutes). Drain. Melt cannabutter in a saucepan over low heat. Stir in flour, salt, and pepper until smooth (about 5 minutes). Slowly pour milk into butter-flour mixture, stirring continuously until mixture is smooth and bubbling (about 5 minutes). Add 4 cups cheddar cheese to milk mixture and stir until cheese is melted (about 2 to 4 minutes). Fold macaroni into cheese sauce until thoroughly mixed. Dessert recipes baked with cannabutter are one of the most popular and traditional ways to use this infused butter. Although tasty, proceed with caution, and don’t eat too many of these tasty treats. Grease a 9- by 9-inch baking pan. In a medium bowl, combine the flour, sugar, and cocoa powder. In another small bowl, whisk together the melted cannabutter and eggs. Combine the cannabutter and egg mixture with the flour mixture. Bake the brownies for 25 to 35 minutes until a toothpick inserted in the center comes out clean. Spread with chocolate frosting or serve with vanilla ice cream. Preheat the oven to 375 degrees Fahrenheit. Line four baking sheets with parchment paper. Place the softened cannabutter and sugar in the bowl of an electric mixer. Cream the butter and sugar together on high until light and fluffy (a few minutes) Then, turn the mixer on low and add the eggs and vanilla extract. With the mixer running on low, slowly add the flour mixture. Scrape the bowl and beat again for 30 seconds. Use cookie cutters to form the dough into shapes and place on greased cookie sheets. Bake each sheet of sugar cookies for 10-11 minutes until the edges are slightly golden and the centers are just barely set. Cool completely on cookie sheets.